Our women prisoners deserve a lot more of the ACT Corrections Minister Shane Rattenbury’s time and effort. When the ACT Assembly acted a decade ago to bring the prisoners of the ACT home and to house them in an ACT based facility, it sounded like a positive step. The idea that people’s relatives could visit more easily and that management of release, appearances in court and the like could be made easier for remandees and prisoners alike sounded better than having our prisoners accommodated at prisons all over NSW. In particular, I had hoped that especially for women this facility would mean that more of them could see family and offspring more often and could have their rehabilitation managed by a community with a great interest in their futures post-prison. Sadly, the story of our prison has not been as glorious as those who envisioned it had hoped and now we are faced with a situation where there are a number of areas of concern for inmates. We have remandees and sentenced prisoners housed together, which poses difficulties from a human rights perspective for those ultimately found not guilty. We have issues with how therapeutic drugs like Suboxone and Methadone are administered so as to avoid inmates poisoning themselves or their fellow inmates. We have a minister who has for years studiously promoted a free needle exchange program under the justification of safety to assist inmates to take illegal drugs in their cells with cleaner needles than those they currently get hold of. Unfortunately, this campaign sends mixed messages to both inmates and employees of the prison that the fight to stop illegal drugs entering the prison that gives up on the idea of a clean facility where inmates can imagine a life without substance abuse and life controlling health issues. But one of the accidental outcomes of our prison is the unfortunate lack of focus over the last few years that has been put onto the women prisoners and the lives they lead inside our prison and indeed their opportunities for an improved life post-release. The male population of the Alexander Maconochie Centre hovers today in the high 400s and women detainees are a fraction of this at between 30 and 45 this year. Women have access to education programs and medical assistance as per the other detainees. However, the similarities between the opportunities for the men and women end there. The men in the AMC are now being offered the chance to work in a newly constructed laundry and a soon to be opened bakery. The women are not. The recent capital works which saw a huge increase in the number of beds available to house men was completed now seeing over 500 beds available for the men to occupy and I am surprised to have discovered that in all of this work no thought was given to the women needing an increased number of beds. The government claims that they could not possibly have known that the numbers of women in the AMC would rise as sharply as they have over the past year. However, even very basic research shows that women in prisons is a figure steeply rising across the world at present and over the last few years. I also raised this matter as far back as February when the number of women detainees had already exceeded on some nights the number of beds on the women’s side of the prison. This week it has come to light that we have now reached the chaotic state of there being up to 45 women in a prison designed to house less than 30. These women are now being housed all over the place at night time, some in the management unit – which is now at capacity – and some in the cells at the prison health centre – which is very close to capacity at times. I am really astonished that a minister who has seemed pretty competent in the past has let things get to this stage. Where will he be housing women when we get to 50 women soon? Just because they are in prison and can’t make a fuss, doesn’t mean that they can be ignored. If you went out and grabbed 1000 Canberra voters and asked them to list their top ten priorities on what they base their vote on I would be very surprised if “Convicted Criminals Comforts” was mentioned once in the ten thousand responses. Kebabs would be the number one priority. Access to high quality kebabs would certainly rate higher on my radar than prisoners rights. I do love a good kebab! Katy Gallagher as Chief Minister won an election with prison NSP as part of her policy platform. Her opponent dragged that argument to the lowest common denominator and recycled some of the rubbish read hereabout … giving them drugs, a prison awash with needles, sending the wrong message (lolz), offending the sensibilities of prisons officers who are so committed to the welfare of the inmates they are stricken with the thought that people in detention might be “supported” to use drugs, and my personal favourite lie that detainees don’t want a prison NSP anyway. Takes more than the noisy minority and rent-a-crowd to win an election. What an incredible but illuminating reply. “Comfort”? Who said anything about “comfort”? Do you honest believe that a detainee being able to access an equivalent level of healthcare and human rights as that available in the community is a matter of “comfort”? You have done this discussion a considerable service by betraying your underlying philosophy and objection. I’ve always thought that most of the objection to evidence-based corrections and justice health policies relates to the perceived unworthiness of the inmate rather than a problem with the evidence. Sorry, you misunderstood. As I have previously stated I have no objection to a prison needle exchange program provided the convicted criminals have to deal with the consequences of choosing to (continue to) engage in illegal activity, just as the general public have deal with the consequences for choosing to engage in illegal activities. No one is forcing anyone to break the law, but as an adult exercising free choice, you need to accept that there are consequences. My comments on ‘comfort’ was in regard to your ‘Stalag 17” statement that the public wouldn’t accept things such as no-contact visits for convicted criminals and that is a strong enough issue for people to base their electoral votes on. I doubt it would even rate on most peoples electoral radar. The government won’t turn it into Stalag 17 and the community wouldn’t cop that anyway. The noisy minority and rent-a-crowd wouldn’t accept it and would bleat loudly about it, but the vast majority of the public would have no concerns with convicted criminals being inconvenienced and would actually support it. You’re talking a lot about how it’s an impossibility to have a drug free prison, despite it being done elsewhere. You’re talking a lot about drug free prisons elsewhere, without a shred of evidence to support that. For all we know there’s a prison somewhere in Greenland with security so brutal that a fly can’t penetrate. But if they’ve achieved that at the expense of rehabilitation then they’ve achieved nothing. That’s what’s wrong with the “I’m so tough I reckon strip search them (even those with a history of sexual abuse), deny them contact visits with family, give them no privacy, search their cavities, make them do hard labor” approach. Yes it’s probably feasible to reduce the supply of contraband to practically zero, but the conditions necessary to achieve that will undermine the purpose of incarcerating people in the first place. If they’re not coming back to the community as better people, then we are failing them. You’re also adamant that there’s nothing more that can be done at AMC despite not being able to outline anything that’s be tried so far. I asked you earlier to provide some details on what’s actually been tried in an effort to curb the flow of drugs and you didn’t. No. I’m adamant that a drug free prison is an unattainable aspiration. The government won’t turn it into Stalag 17 and the community wouldn’t cop that anyway. I could have a crack at answering the question you asked but you’re asking the wrong person. Why don’t you invite someone who works there, or someone who has portfolio responsibilities over the facility to answer your questions? Even better, how about you stump up some evidence that what you assert is true? The essence of what you’ve said is “too hard, don’t try”. That sounds like a cop out to me. Considering how much money we’re spending on this prison, we should be seeing better results than we’re getting. No it’s not what I said at all, and you do yourself no credit by running down a straw man. Let’s be clear about this, what I’m advocating is a harm minimization approach. We need investment and evidence-based effort in all three pillars of supply reduction, harm reduction and demand reduction. WTC: claims of a drug free prison in Japan and evidence of a drug free prison working effectively to rehabilitate inmates and reduce recidivism are two different things. .
Two different things, and the AMC hasn’t managed to achieve either of them. Is our recidivist rate still one of the highest in the country? It’s been a year or two since I checked. If that was the case I wouldn’t be here prosecuting an evidence-based argument for change. You’re talking a lot about how it’s an impossibility to have a drug free prison, despite it being done elsewhere. You’re also adamant that there’s nothing more that can be done at AMC despite not being able to outline anything that’s be tried so far. I asked you earlier to provide some details on what’s actually been tried in an effort to curb the flow of drugs and you didn’t. The essence of what you’ve said is “too hard, don’t try”. That sounds like a cop out to me. Considering how much money we’re spending on this prison, we should be seeing better results than we’re getting. What about WTC’s sensible suggestion about these criminals having no physical contact at all with visitors and all visits being carried out with a impenetrable barrier between the incarcerated criminal offender and their visitor? You certainly haven’t addressed that option. Seems like it would be fairly easy to do. You’re absolutely right. That would go a LONG way towards stopping the flow of narcotics into prisons. Drug free prisons are only an ‘unattainable aspiration’ because their is no political will to enforce the necessary steps to make it so. And this is really what it comes down to. We have a Minister for Corrections who has no interest in doing anything about the issue. Nothing has changed. Drugs – tick. Needles – tick. Harm – tick. Financial cost of healthcare for preventable diseases – OMG tick tick tick. With the incredibly expensive costs of treating preventable blood borne viruses, the Australian taxpayer is footing the bill for the most costly response to a problem with more effective and efficient solutions that we don’t implement because some people clutch desperately to a dream that one day our prisons will become drug free environments.. I say a drug free AMC is an unattainable aspiration. You say “no it isn’t, because it should be achievable”. Corrective Services said that too, and were proved wrong. So how long do we wait for this to eventuate? Another eight years? Ten years? Twenty years? Preventable harms that directly result from our current policy settings are happening now. Do we overlook these hoping that one day we’re going to win the war on drugs or do we consider the evidence from prisons around the world who are already successfully overcoming the issues? The answer surely is not to take any one ‘random’ poster on an internet forum too seriously. This is why we need evidence and credible experts to guide our policy analysis. An interested reader might be swayed by your argument, or they might be swayed by mine, but for sure they’d be better off reading the prison NSP policy position of an eminent body such as the United Nations Office on Drugs and Crime. Read that if you’re interested in evidence rather than guesswork. Prison security is permeable because it involves humans, and where humans exist so too do market forces. The government has declined to use the “all box visit, rubber glove, no family groups, 24/7 sniffer dog” approach because the ultimate goal of the prison – making inmates into better people in a system that supports and promotes human rights – is compromised by an obsession with brutality and inhumanity. WTC: claims of a drug free prison in Japan and evidence of a drug free prison working effectively to rehabilitate inmates and reduce recidivism are two different things. Make no mistake, there are countries achieving positive results with their corrections services – heck, some countries are now having discussions with what to do with empty prisons – and I’ll give you a hint, it’s not because they’re ramping up a tough on drugs, impermeable prison walls approach. And for the record, James_Ryan does not believe that everything is tickety-boo, or too hard, and that we should just give up. If that was the case I wouldn’t be here prosecuting an evidence-based argument for change. If everything was tickety-boo or too hard and we should just give up, then I’d be calling for no change at all. Remember, when the prison the established an NSP was first considered. Corrective Services said “no, we’re going to have drug free prison instead”. Eighteen months later a review was undertaken by expert researchers who found that Corrective Services claims of being able to operate a drug free prison were far from the mark and that an NSP should be considered because of the large amount of drug-related harms caused by the current reality. “It should be possible to prevent [illicit drug] entry”. Here again you advocate basing policy on an aspiration rather than reality. It should be possible for motor vehicles to safely navigate our roads without crashes. If everyone followed all the road rules and drove defensively, we could do without seatbelts and roadside barriers. Yes, theoretically that is true, but reality tells us that complete road safety is an unattainable aspiration. Worthy goal? Yes. Achievable? No. So we base our policy on a harm minimization approach of enforcement at one end, education at the other, and harm reduction measures in the middle. If you seriously believe that prison staff turn a blind eye to drug use in the AMC, you need to get a grip. “If only they tried harder” is a banal argument destined to achieve nothing but the status quo. Someone has already pointed out an example of a successful drug free jail in Japan, did you conveniently ignore that? Your defeatist attitude is why we have this drug problem. Road rules can’t be used as an example of why policies fail because we can not control people’s actions. We can put physical barriers in place to prevent drugs passing from visitors to prisoners. If we could put physical barriers between cars on the road We’d do well in stopping collisions. It can be done but again you are supporting a “too hard, why bother” attitude. Why? I can not understand what reason anybody would have against using a tried and tested solution to this problem, unless of course that solution goes against some belief in a misguided interpretation of human rights law. Prison walls are pointless if drugs and other prohibited social luxuries can get through. It should be possible to prevent (illicit drug) entry”. Here again you advocate basing policy on an aspiration rather than reality. It should be possible for motor vehicles to safely navigate our roads without crashes. If everyone followed all the road rules and drove defensively, we could do without seatbelts and roadside barriers. Yes, theoretically that is true, but reality tells us that complete road safety is an unattainable aspiration. Worthy goal? Yes. Achievable? No. So we base our policy on a harm minimization approach of enforcement at one end, education at the other, and harm reduction measures in the middle. You are trying to compare the general population who are free to go about their own business (including driving badly, with consequences) with a criminal population who should be completely controlled and monitored at all times (but apparently are not, and have no consequences for their actions) The comparison makes no sense. You won’t get credit citing Clive Williams in a discussion about evidence-based drug and alcohol policy in prison or anywhere else. There is a man who should stick to what he’s good at. I can still remember him sticking his oar in the water via letters to the editor in the Canberra Times at the height of the prison needle exchange debate. He got his pants pulled down and quietly went away. No one listens to his ranting on these issues, as you can see for yourself if you look at the rubbish he was advocating in that article. Have any Australian jurisdictions taken on his advice? “Methadone, syringe and counselling programs” are soft options apparently. Yet according to Clive three-strike laws are good, smokefree prisons make inmates calmer, and harm reduction is an alternative to supply reduction rather than something that can be implemented in parallel. Yeah, cool story Clive. James Ryan, you talk about prison drugs like street drugs and that the economics is the same. How do inmates pay the high costs for the privilege of getting a fix? It isn’t like they get paid for their stay inside. If they are making arrangements for those on the outside to cover their costs, then surely stopping the drugs supply into prison will help in the fight against drugs and crime on the outside too. By allowing it to continue where we are in a good position to do something about it, we are pretty much saying publicly that it is just too hard and not worth the effort. Any argument about economics or harm minimization is akin to accepting failure and by allowing it to continue, keeps the suppliers in business. Remove their market, they have to close up shop. Also, by allowing this “too hard” problem to continue, it perpetuates the motivation for inmates to keep committing crime, in order to feed their habit. What part of rehabilitation allows a problem issue to go unaddressed? A drug free prison is an unattainable aspiration. No it is not. The reason most ACT offenders (over 80%) are in jail is because of drugs. Letting them do drugs in jail means they come out with the same problem they went in with, so they are guaranteed to reoffend. And I’m not using some ‘inherent logic’ to conclude this. The Productivity Commission’s report on government services shows the ACT has the highest recidivism rate. So we’ve got a supposedly human-rights compliant jail, that is the worst jail in the nation. I’m also outraged at the apathy to the jail’s recidivism and mismanagement consequences. Each subsequent victim of an unreformed addict suffers a burglary, a beating, a robbery, because the gubmint cannot control a steel and concrete box. That’s on Rattenbury. And if we cannot reform these offenders, how ethical is it to lock them up and deny them freedom? Why not segregate them at Thredbo where they can work on the moguls? But James Ryan reckons things are tickety-boo and a certain level of failure is to be allowed. Not one more victim, not one more reoffender. Read my other posts. A drug free prison is an unattainable aspiration. You might like to think that “they” haven’t tried to stop the supply of drugs – indeed, that “little effort” is applied – but remember our prison is no different to any other. Whatever our problems are that lead to inmates accessing drugs and other contraband, they’re the same the world over. 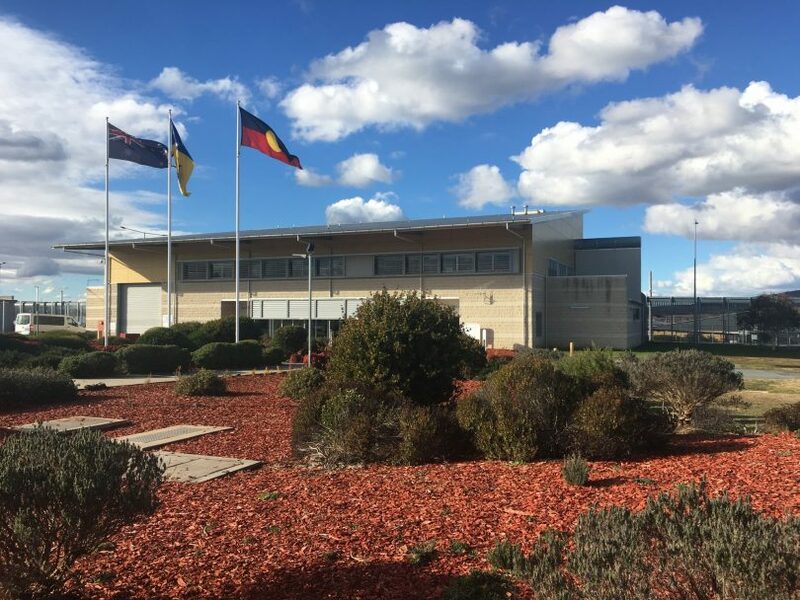 The ACT government approach has been to encourage implementation of a needle and syringe program trial at the AMC to reduce the incidence of shared needle-related communicable diseases, mainly viral hepatitis, rather than try to eliminate illicit drugs in the prison system, which is conveniently seen as a separate issue. An alternative policy would be to stop illicit drugs from entering the AMC and treat drug addiction in a controlled environment, as was done in New Zealand. Despite some assertions that there have always been illicit drugs in prisons, it should be possible to prevent their entry. There are limited ways illicit drugs can enter any prison: mainly through prison officers, visitors, support staff, incoming prisoners, food deliveries, items sent to prisoners, or being thrown in. The most likely avenue for their entry at the AMC is through visitors. That avenue could be blocked by physically separating prisoners and visitors, or strip and body-cavity searching prisoners leaving the visiting area. One Japanese prison I visited allowed one 15-minute visit a day, one visitor per visit, physical separation of the visitor and prisoner by a glass panel, and a prison officer with each prisoner during the visit. Needless to say, illicit drugs were not an issue in that prison. Have they tried this at AMC? Of course not. It’s easier just to say “too hard, don’t bother”. This is necessary because the AMC, like all prisons, has been unable to prevent the availability of drugs and other contraband. People like Ms Jones can base an argument on “they shouldn’t have drugs”, but they do have drugs and they have needles with which to inject. Our interventions and policies must respond to that reality rather than an unattainable aspiration. I doubt very much they’ve actually tried hard to stop drugs coming in. Why would they when it’s so easy to just assume a drug free prison to be an “unattainable aspiration”? Most aspirations are unattainable when ittle effort is applied to achieving them. So tell me then, how are they working hard to stop the supply of drugs? What vetting process is in place for guards who seek employment there? What new measures have they adopted to stop the flow of supply? I doubt you can answer any of those questions, but you’re very quick to claim that they’ve done all they can do. ” but remember our prison is no different to any other” – that’s a pretty ridiculous claim considering the comfortable conditions and lax approach taken in our “world class human rights compliant prison”. I suspect the problems rest ultimately in market economics & that the efforts of those trying hard to keep drugs (etc) out are matched by those trying hard to get drugs (etc) in. Like any form of prohibition the more successful the measures to contain supply, the higher the price and the resulting greater incentive. The most successful approaches to drug policy balance effort reducing supply as well as demand, and also in the middle ground by reducing harm. That’s called “harm minimization”, and it underpins all Australian drug policy. Needle exchange programmes are harm reduction strategies. They deal with “what is” rather than an alternate universe. And what would happen to needle exchange programmes if suddenly or progressively drug (etc) supply reduction measures became successful? With no drugs to inject, there would be no drug related harm to reduce with a needle exchange so it would sit idle. Supply reduction, harm reduction and demand reduction are not “either, or” strategies. They work in combination. When they are not allowed to work in combination, they don’t really work. What are we really achieving by continuing to fill up our local jail?